What was your brief for Australia Day? 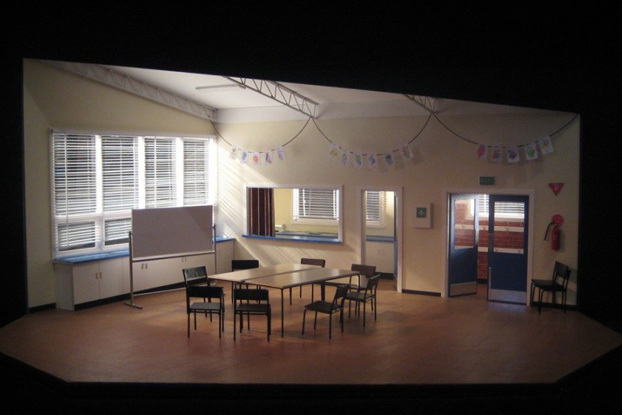 It was pretty clear from the start that the design solution for the play would be naturalistic, that we would be creating two believable sets for each of the acts. The same for the costumes; that each of the characters would be dressed in believable clothes. Not caricatures, but plausible, real people. I looked at a couple of primary schools in Melbourne - I was particularly interested in the 'multi purpose rooms'. I was looking for details that an audience might recognize in the set for the first act, and I found a marquee hire company nearby where I live, who let me look at how they are structured. I searched the internet for images of Australia Day celebrations, as well as local council committees. All the clothes that we settled on came from those images. What did you enjoy most about this show? It was a combination of a very funny but also insightful script (written by someone with whom I'd worked very happily previously), a director who is also an old friend, and an absolutely delightful cast, several of whom I'd worked with before. I think the biggest technical challenge is the requirement of the script for a complete set change during a 20 minute interval, from a totally detailed multi purpose room in a primary school to the interior of a marquee erected on an oval complete with grass. Have you ever considered a career other than theatre designer? Not really. I always wanted to design for the theatre, and I started out as a child with puppet shows and model theatres. I think I was hooked at an early age. I can still remember being taken to the Princess Theatre in Melbourne as a ten-year-old and seeing the effect of a gauze for the first time. I think I went straight home and tried to recreate it in my model theatre. What are some of the most outlandish requests you have ever made to a production department? Hard to say… I've just done a production of Rigolettoin New Zealand where we asked them to build us a marble palace for the Duke (that weighed about five tonnes), which could then fly out to a height of three metres and hover over the other scenes. I guess the key word there is the use of the word "we". It's always a collaboration between a designer and a director, and in the end if it's an outlandish request, it's coming from both of us. Hopefully if I've articulated the reasons for my request well enough, it won't appear outlandish to a production department. This is hard to answer, there are so many, but here are four: Jocelyn Herbert, an English designer who was never frightened of presenting an empty stage and minimalist design at it's best; Mies van der Rohe, modernist architect, of the Barcelona Pavilion; Edward Gordon Craig, who changed the way we thought about the stage; and Peter Brook, not a designer, but a director with the most beautiful and pure aesthetic. What is the one theatre production you wish you had designed? That's impossible to answer - there are plenty of shows I've seen over the years that I have admired, but never thinking I wish I'd done that. More often than not the feeling is rather "I couldn't have done that". How do you feel watching a production that was designed by you? Opening nights are something to endure rather than enjoy, but they're a necessary thing to go through. There's a sense of completion at the end of the performance, and then it's time to move on to the next project, leaving the actors to it; they're just starting their journey with the play, while you're finishing yours. Having spent a fair bit of my career teaching young aspiring designers, I'm inspired by seeing that the theatre continues to draw people to it, with it's capacity to, entertain, delight, inspire, teach and ultimately to transform. Just as it did to me as a young child.